Parking Lot located across the street at the corner of 13th & Locust. Please contact us for private dining options. We offer our full menu in our 2nd floor private dining space. Bud & Marilyn's is a retro American restaurant from Chef Marcie Turney and Valerie Safran. The menu features updated American comfort food utilizing fresh and local ingredients. 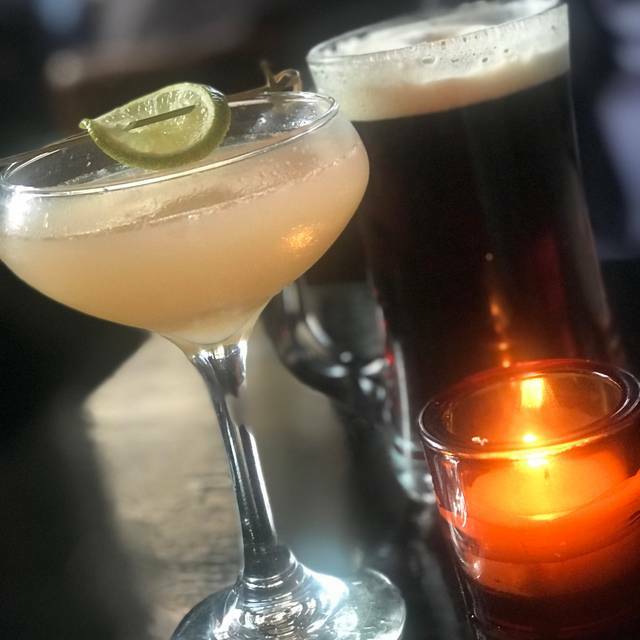 Our bar features local craft beers, handmade American classic cocktails and an affordable wine list. Our focus is simple - good old American cooking, great drinks and warm hospitality. The comfortable dining room seats up to 100. The Mid-century modern design evokes the feeling of an updated rec room from the 1970's and features vintage American flea market finds from all over the country. 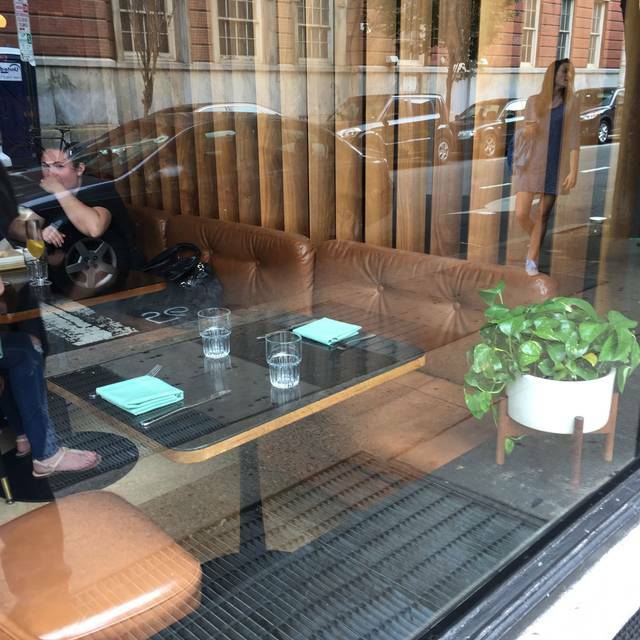 Table seating, bar seating and chef's counter seating are available. 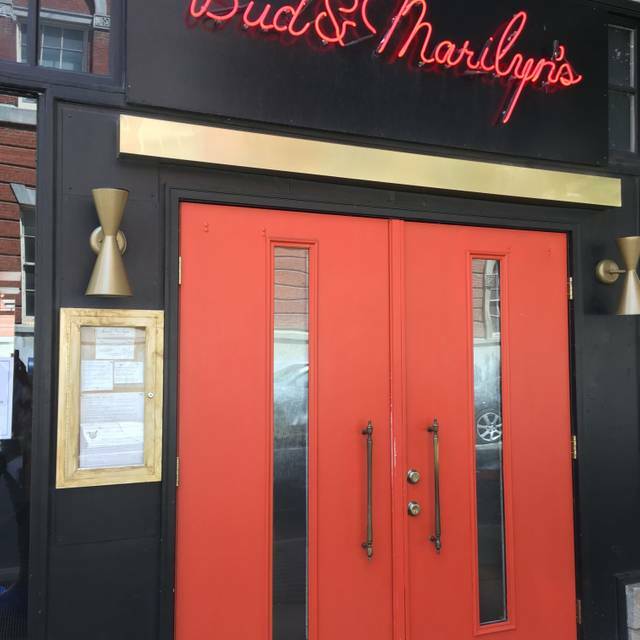 Bud & Marilyn's is located in the heart of center city at the corner of 13th & Locust Street in the bustling Midtown Village neighborhood. The food is remarkably innovative and delicious. The service was excellent. But don’t expect to be able to have a conversation. It is WAY TOO LOUD to hear your partner, unless you YELL. At the same time the din of voices was crushing your hearing, the restaurant was actually adding to the audio-misery by playing music in the speakers overhead. Instead of a delightful dining experience , it was exhausting. The fried chicken here makes my Southern heart so very happy! The servers are exceptional, the atmosphere is peachy keen, and the drinks are delicious! Outstanding food, but pricey. Very noisy. Excellent service. Pretty good fried chicken. Fairly dark inside. Good service. This was my second visit to Bud no milk, no spoon, no refill of hot water and no service. 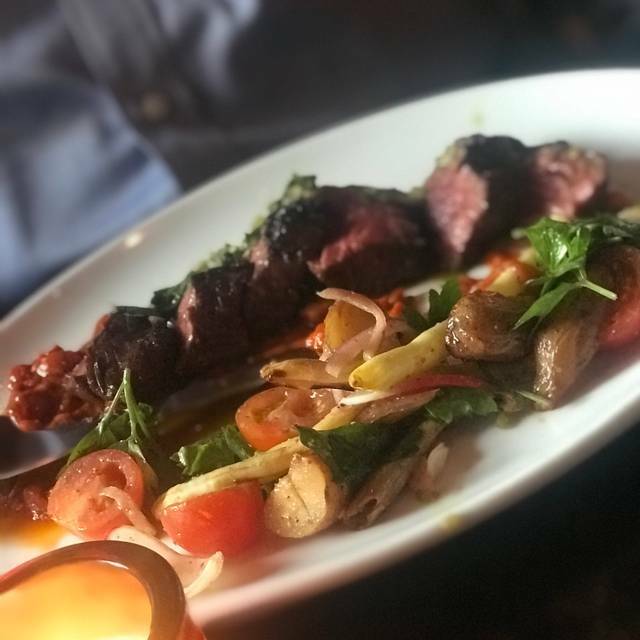 Although the location is very convenient and we were not looking to linger over a long meal , I felt so rushed it took the experience from a nice meal with a friend to feeling like a visit to a fast food restaurant. I don't think I will go back. The food was great: ricotta with fresh figs among the best ever tried in Philly, as well as the liver pate and the falafel cauliflower. The service was impeccable and the wine good. Among the best food tried in Philly, definitely recommend! My wife (of 42 years) and I shared a beet salad. It was delicious. It stood out since depending on the bite, fig, peanuts, beets or carrots were the dominant experience. The dressing was subtle enough to allow the other components to be tasted. We both ordered scallops as an entree. Outstanding! These were grilled perfectly! May have been the most delicious scallops I’ve ever eaten. The portions were ideal leaving room for desert. The apple pie slab ala mode was my choice while my wife choose blood orange sorbet. Again, both were delicious! The service was wonderful. The food arrived promptly. My only concern was that we had a little difficulty with conversation due to noise levels. 5 stars overall! Good food and food choices. Service was a little slow but acceptable. The area was louder than I expected but acceptable. Great happy hour specials. The dinner (porkchop) was very good but was small in size with no side options included. Great restaurant with dimly lit ambiance, but that is not our style unfortunately. I always have a lovely evening at Bud and Marilyn's, which is very close to my condo. The food is consistently high quality. I am a big fan of the brick chicken, and the desserts are to die for. Cocktails are delicious. Service is friendly and professional. All the patrons, who range from kids to seniors, seem mellow, enjoying wonderful meals in a congenial setting. IF ONLY IT WERE NOT SO NOISY! Despite its being just around the corner, I often have second thoughts about going there, because the noise level is shattering. Last Thursday my companion and I, admittedly both seniors, had to SCREAM across our small table in order to have any chance of being heard, but, even then, we sometimes could not communicate. Any kind of sound buffering measures that would cut down on the din by even 20% would make me dine at this excellent eatery more frequently!! Good food priced fairly but wine is pricey. Energetic, yes, but too much noise for any conversation. If you like fried chicken, it’s the best ever! Love this place! It’s always packed so make sure you book on Open Table even on what you may think is an off night. We had a great dinner before we went to the theater. We started with the cheese curds and it was a super starter. Then we devoured the fried chicken and biscuit. We were too stuffed for dessert. We had a lovely chat and the staff were accommodating. The service was excellent. My steak was cooked exactly the way I requested. My friend liked her meatloaf and the Fried Chicken Hot Buns were an excellent appetizer. The Chocolate Cake was enormous and super. Very good place. A little loud but that was due to the fact the bar was packed and every table was taken. Very good comfort food and a solid value for the price. A favorite lunch spot, especially for work-related meet-ups. The food is consistently great with choices for all kinds of folks. Service is always friendly, professional, and highly competent. My only complaint is that we sat close to the door and the draft was chilly. I always take my friends visiting from out of town to Bud & Marilyn’s because I love it that much! My only comment would be that it took a while for our server to greet us and to take our drink order. 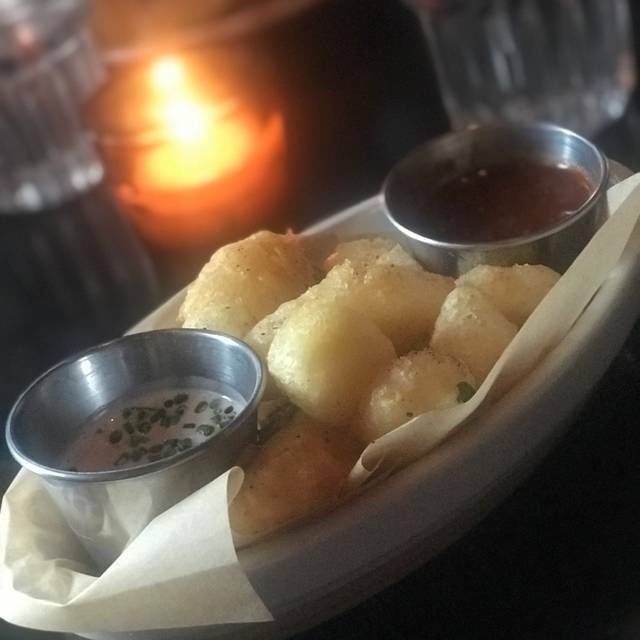 The cheese curds will always be my favorite item and the Regal Beagle cocktail is a must! Great food, healthy portions, friendly atmosphere. We had dinner here before we went to the Academy of music. It’s very convenient and they were very conscientious about getting us out on time. The food was very good. The menu was a little difficult for me since I was trying to eat healthy. As good as it usually is. Andrew pronounced his grilled lamb the best thing he has had in all the times we have come here. My arctic char was also very tasty. As usual, we split the vedge salad, which is just enough for us. We SHOULD have split a dessert, since the sorbet and gelato we each had was far too much for either, and not too tasty at that. Desserts are NOT B&M's strong points. A word to the wise. Love it there! Always a great experience! Get the salmon board at brunch! Great food. Nice place for brunch. Great service! Loved it! Food was delicious. Great atmosphere & fun vibe! First time here. Staff are trained very well because they were on top of everything and very quickly. Kitchen also was very fast. The salad with the onion rings on top was one of the highlights. Great presentation and taste. 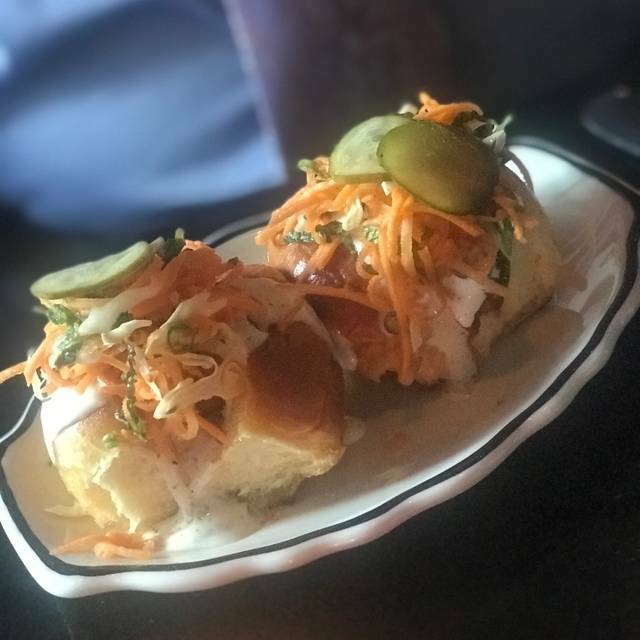 The chicken sliders were also excellent. Would love to eat both of these again. The stroganoff was very tasty and would also have this again. Overall, would go back for sure. Although it was VERY noisy, we enjoyed our dinner. I had a deliciously prepared Atlantic Char and my friend had scallops. Nice sized portions at a fairly reasonable price. Great service. We split a wonderful carrot-beet salad to start. We will be back. Very good! We really enjoyed everything ! I will say the fried chicken was good but not the star! The biscuits were tremendous and the brat buns were awesome! Will be back! Food and service is always outstanding! 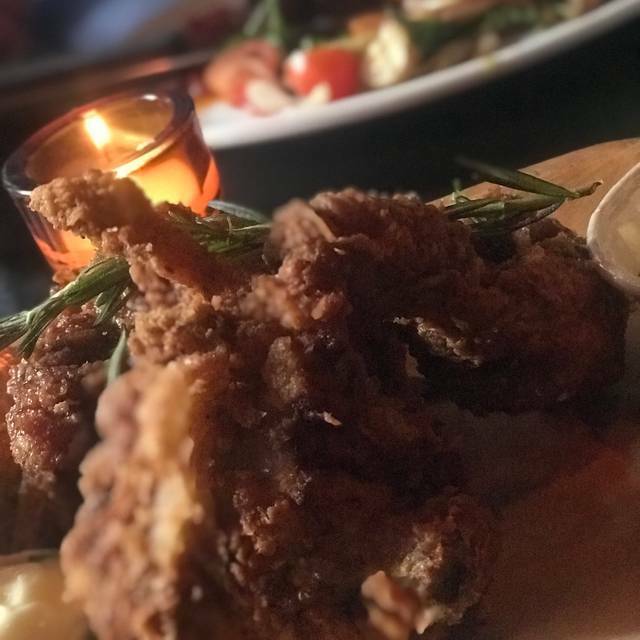 Fried chicken and scallops are particular standouts! This place is really great for some classic American food like fried chicken! However, the noise was way too much and the drinks were extraordinarily expensive. Good for friends, but not for a date. We made reservations the same day for a Friday night, and it was a good thing we did because there were people waiting to dine most of the time we were eating. As a result of late reservations, I suspect, we were seated between the door and the bar, so it was drafty and noisy, not an optimal situation. The tables, at least in this area are very close together, so close our thin waiter could hardly get between them, so there is no chance for intimate conversation. We ordered specialty drinks which were outstanding, an old fashioned and a vodka something or other. We tried several appetizers, steak tartare, Nashville buns and cheese curds. The steak tartare was very good, although I’d prefer to have the steak and “bread” separate so I can portion it myself. Additionally, the crouton becomes slightly soggy when the tartare mixture sits on it. The cheese curds are very good, but the sauces left a lot to be desired. They almost felt like an out of the bottle after thought. And my husband said the Nashville buns (think sliders) were ok. It seemed as there was a trend with anything with a breaded coating (cheese curds, chicken on the Nashville buns, fish fry). All the breading tasted the same. 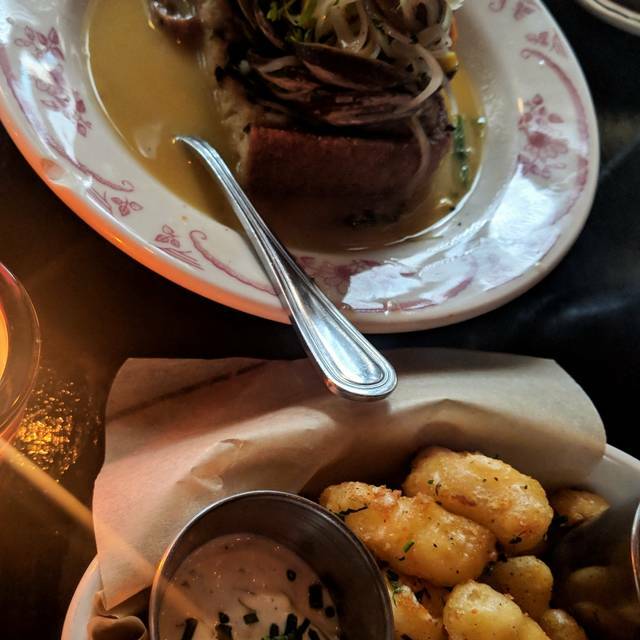 For mains, we had the cod fish fry and the short rib stroganoff. The fish fry was very good, although I’d personally prefer a slightly lighter batter, as cod is a delicate fish. The short rib stroganoff was so salty my husband couldn’t eat it and he’s not that discerning and we love salt. We had read reviews that some of the food was very salty. One would think the chef would take note of all the comments and the loss of taking that off the bill. Everything we ordered was excellent. Great fried chicken. Surprisingly great steak. Great comfort food. Good service. 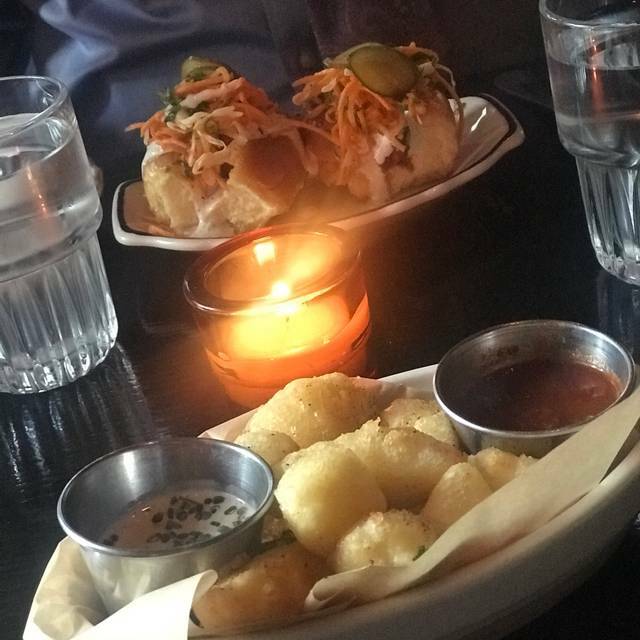 Nashville hot buns, highly recommend! Everything was tasty. Great ambience. I look forward to coming back. Fried chicken and Reisling night was great. Need to have more of these since I raved about it to all of my friends! As always, the food was wonderful and the special menu for the evening was particularly wonderful. I’d come back again for the biscuits alone!